The following places all have links to the Tudor period and are great places for Tudor history fans to visit. The Mary Rose Exhibition, HM Naval base, Portsmouth – See Henry VIII’s famous warship at Portsmouth, where it is being lovingly restored. The Mary Rose, which sank in 1545, is the only remaining 16th century warship on display in the whole world. 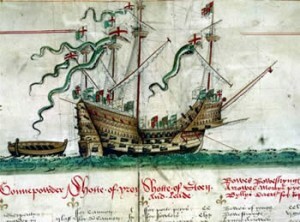 She was built betwenn 1509 and 1511 and was one of Henry VIII’s favourite ships. The Golden Hinde – This galleon is actually a 1970s reconstruction of Sir Francis Drake’s famous ship which circumnavigated the world between 1577 and 1580. This reconstruction is a fully working ship which also has circumnavigated the world and which can now be visited at the St Mary Overie Docke in Southwark, London. The Golden Hind – This reconstruction of Sir Francis Drake’s famous galleon can be found in Brixham Harbour, Devon, the place where Sir Francis Drake actually lived and worked. This life size replica has been moored in the harbour since 1963 and is now used to educate people about Sir Francis Drale and life at sea in the 16th century. Shakespeare’s Globe Theatre, Bankside, London – American director and actor Sam Wanamaker set about building this memorial to Shakespeare and his original Globe theatre in 1987 and this reconstruction of the famous Elizabethan theatre gives visitors a real taste of Tudor theatre and an understanding of Shakespeare’s performances. Wikipedia have got a great page on the history of the original Globe Theatre – click here to read it. The Rose Theatre – London Bankside’s Rose Theatre predates the famous Glove theatre and excavations are now underway to develop its site. It was built in Bankside, London, by Philip Henslowe in 1587 and performances staged there include Shakepeare’s Titus Andronicus and Henry VI Part 1, and Marlowe’s Doctor Faustus. Remains of the Rose Theatre were discovered in 1989 and around two thirds of its original foundations have now been excavated. Visitors can join tours or go to open days. Stratford-upon-Avon – A lovely English town which was the birthplace of William Shakespeare and is the home of the famous Royal Shakespeare Theatre and Royal Shakespeare Company, and lovely medieval and Tudor houses. Other attractions include Shakespearience, Falstaff’s Experience, Holy Trinity Church where Shakespeare and Anne Hathaway are buried, the Stratford Brass Rubbing Centre, the 16th Century Harvard House, cruises along the River Avon and shopping in the town centre. 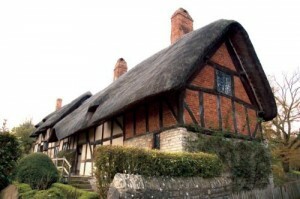 Stratford is also within easy travelling distance of Birmingham, Oxford, Warwick, the Cotswolds and Blenheim Palace. Lavenham, Suffolk – A beautiful English village which still has many 16th century half-timbered buildings, including its famous Guildhall and Wool Hall. It also has an historic market cross, which was used for bear baiting. 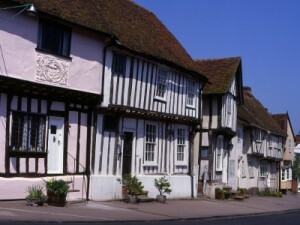 You can read more about its history at http://www.britainexpress.com/villages/lavenham.htm. The William Turner Garden – This garden is located in Carlisle Park, Morpeth, and is famous for its wonderful Knot Garden, Introductions Border (planted with plants introduced to England in the 16th century) and “Physic Garden” which is full of Tudor medicinal plants and herbs. The garden is a tribute to the “Father of English Botany”, William Turner (c. 1508-1568) who was born in Morpeth.